The Fossil Q Venture HR is a Wear OS smartwatch that combines elegant design with must-have functionality. The latest iteration of the Q Venture smartwatch, it's every bit as stylish as its predecessor and boasts long-awaited tech upgrades to match its main rivals that we've long been waiting for. This fourth generation watch from the Fossil Group packs NFC to allow you to make contactless payments through Google Pay. It's now waterproof so you can take it for a swim, plus its standalone GPS means you can run, walk or cycle without relying on your phone for support. Most excitingly, the Q Venture HR introduces a wrist-based optical heart rate monitor, bringing it more in line with competitors such as the Apple Watch Series 4 and Fitbit Versa. We put its new features to the test to see if it lives up to its potential. Here's our full verdict on the Fossil Q Venture HR. There's no denying the Q Venture HR is one of the best looking smartwatches on the market. Neither boxy nor bland, it comes in a choice of nine cases, ranging from classic stainless steel to rose gold-coloured metal with crystal embellishments. With a 40mm wide face and 13mm thickness, the watch is comparable to the previous Q Venture model and is super lightweight at just 50g for the model we tested. The watch is compatible with all 18mm straps meaning you can adjust it to suit, though Fossil's designs cover most bases with strap options including leather, silicone and stainless steel bracelet. The smartwatch itself is waterproof to 50m though if you plan on taking it swimming, you'll need to get yourself a silicone strap obviously. The watch comes with three preset face options: Essential Digital (a simple display on a black background); Fashion Digital (a digital clock with chiselled glass or marble effect background); and Original Boyfriend (an analogue clock with chronograph design). While each face comes with pre-programmed data points, all of these can be customised to suit your uses – you can adapt them to provide a shortcut to your favourite phone contact, to show your step count or to leap to your app of choice. On top of these faces, there are 39 other options you can add through the Wear OS app or the watch itself. The round display is easy to navigate with a crisp, clear touchscreen. As with the third generation Q Venture, there’s a 3mm black bezel around the face, which detracts somewhat from the otherwise elegant face designs but can be hidden if you select a dark colour for the watch face. There are three buttons on the right of the watch. The watch crown is used to switch the screen on and to access apps, plus it can be twisted to scroll on the screen. The top and bottom buttons automatically go to the Fossil Q and Google Fit rings respectively, but these can be changed. I kept the lower button as it was, but adapted the top button to launch Google Pay as that was the feature I used most. Just like the Q Venture before it, this watch runs on Google's Wear OS and has 4GB of storage – enough to keep it running smoothly, in our testing, once you’ve installed apps and downloaded music. Aside from the watch face action, it's all business as usual. The operating system has been treated to a few updates this year making it a quicker, cleaner experience. The Q Venture HR has all the standard Wear OS features of phone notifications, Google Assistant voice controls and music playback control, but with one major improvement: NFC. The lack of this feature in the previous model was a disappointment for us, but its addition to the Q Venture HR brings the watch in line with its competition. After holding off on adding NFC to their devices, Fossil has finally joined the likes of Huawei and Tag Heuer by integrating it into the Q Venture HR and Q Explorist HR watches. Setting up Google Pay on the device is simple and suitably fuss-free: after adding a card to Google Pay on your phone and verifying this with your bank, open Google Pay on the Venture HR and select Add Card. The watch will load the cards available on your account and give you the option to add them to your device. Following this setup process, I found the contactless payment process totally seamless – once you've opened the Google Pay app on the Q Venture HR, it will prompt you to hold the watch to the card terminal and vibrate as the connection is made. For additional security, you're prompted to create a pattern, PIN or password to use with the app, and Google Pay will only function when the watch is unlocked and on your wrist. Overall, a user-friendly feature with no teething issues – ideal. The wrist-based optical heart rate monitor takes a reading every 20 minutes, or you can prompt one by tapping the heart rate icon on the home screen. This isn't as immediate or constant as HRM functionality on devices such as the Apple Watch, but is easily accessible for a quick reading. Keeping an eye on your resting heart rate, a useful indicator of fitness over time, is also probably the most useful way to use heart rate tracking on Fossil Group's fourth gen of smartwatches. Fossil wants people to use the heart rate monitor for workouts too, though. I tested the Q Venture HR against a Garmin Forerunner 935 running watch and HRM chest strap to see how it compared. The Q Venture HR was slow to pick up my heart rate increase at the start of workouts (for example, reading in the 70 bpm zone when my heart rate was around 110 bpm). There was a significant delay in heart rate change reported compared to the Garmin. In an interval workout, it took about 20-30 seconds longer for my heart rate increase to show up on the Venture HR – for example, the Garmin read 150 bpm while the Venture HR read 110 bpm. This would then switch during a rest period – the Garmin would report my heart rate dropping to around 95 bpm but the Venture HR would go up to 130. Overall, there seems to be a delay in heart rate data being processed by the Venture HR, perhaps because of the limitations of wrist-based optical heart rate monitors. It would be great for future models to allow pairing with a third party heart rate straps. For now, the Q Venture HR will no doubt be fine for casual and beginner runners but for anything more serious, it's worth paying more. The big sell of this watch is that its GPS is untethered, meaning it finds signal independently and doesn't piggyback off your phone's location settings – a first for Fossil's smartwatches. Connecting to GPS was easy enough – I just had to ensure that my phone's GPS was switched off and that the watch wasn't connected via Bluetooth. However, the signal regularly dropped out and when I took it for a run alongside a Garmin running watch the Q Venture HR recorded a distance that was 29% shorter – a pretty significant difference. This is potentially a teething issue with the tech or reflective of the fact I tested it in a built-up city environment. When tethered, the GPS was slightly more accurate, measuring a 21% shorter distance than the Garmin. Either way, the watch provides a decent rough estimate of distance covered, but perhaps isn't ideal for serious runners or cyclists. A quick note – the Fossil Q Venture HR itself (mind the straps) is also now waterproof to 50m so good for swimmers. We haven't been able to take the Q Venture HR to the pool yet but look out for our Fossil Q Explorist HR review – the men's equivalent to this watch – coming soon on the site. Fossil estimate that the battery life of this watch will last all day, which is pretty much spot on. That said, if you’re using features such as GPS and heart rate tracking during exercise, the Q Venture HR will run down more quickly. Either way, this is one watch that you'll need to charge nightly – at least – so bear that in mind. The Fitbit Versa, for instance, which admittedly doesn't have built-in GPS, can go for four or five days on one charge. Still, it charges more quickly than the previous version, taking just an hour to go from 0 to 100%. 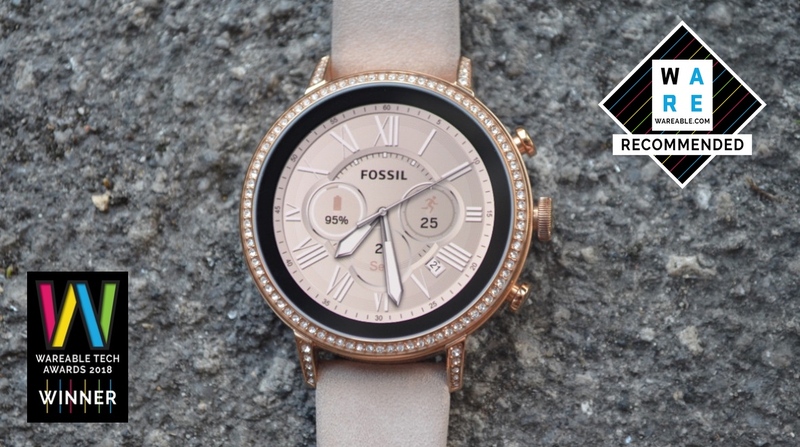 A slick addition to Fossil's smartwatch arsenal, the Q Venture HR maxes out on style. Google Pay is user-friendly and adds serious value. Meanwhile, its GPS and heart rate monitoring are good for casual runners and base-level measurements, but we wouldn't currently recommend them as a replacement for a more specialised fitness tracker or running watch. That said, the Q Venture HR is a decent upgrade from its predecessor and, for those looking for a regular, user-friendly smartwatch, is a great option at a lower price than competitors like the Apple Watch. Can you please be clear when writing about smartwatches whether or not they are capable to make and receive phone calls. This is an essential functionality for me and many of your readers. It allows to pick up when receiving a phone call right from your watch and have the phone call via the watch. This does not mean that the watch needs to have an LTE functionality as it can be done over Bluetooth (and I think wifi for the Apple Watch). This comes in handy when your smartphone is somewhere else in the house for example. Or in case of elderly people, being able to initiate a call from the watch could be a life saver. Watches like the Apple watch and the Samsung Galaxy watch have this functionality. So does this watch supports making and receiving calls?